Want to be hired by Vicky? 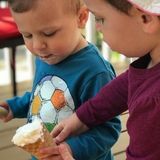 We're looking for a kind and energetic part-time nanny to help us with our 2.5 year old little girl and 1.5 year old baby boy along with some light house work, meal prep and clean up. Our daughter is enrolled in Montessori party time, she has an energy and personality that will keep you coming back for more. Our baby boy just loves his sister and is a crowd pleaser, he really knows how to get the attention of others and is a social butterfly. We are blessed with 2 wonderful children and are looking for someone who will help us nurture our children into the amazing people we believe they will become. We are looking for help from 11:00am to 6:00pm Monday to Friday. ECE preferred but not required. If you'd like to setup an interview please do not hesitate to contact me.